Projects worth £3 million have been approved by the UK Government as an initial allocation of City-Region Deal funding. Projects worth £3 million have been approved by the UK Government as an initial allocation of City-Region Deal funding. The commitment was confirmed during a meeting in Inverness between David Mundell MP, Secretary of State for Scotland and Margaret Davidson, the leader of Highland Council. The business case for the first project, which was approved by the City of Inverness Area Committee on 2 June, 2015 relates to the upgrading of grounds and access to Inverness Castle to enhance the experience for visitors, which is linked to a separate project being undertaken by the Council to create a public viewing platform at the North Tower. The second project also approved by the Committee is to create a free public access Wi-Fi scheme for the City of Inverness to increase digital connectivity, progress the “smart cities” initiative and enhance the visitor economy. This is good news for Inverness. It demonstrates our commitment to City Deals and the benefits they can bring for local areas. The initial tranche of funding will enable Inverness to capitalise on its heritage, while helping the city to enhance its digital connectivity, something which will be of huge benefit to both visitors and residents. City Deals give more power to local areas and I believe they can benefit communities across Scotland. Instead of power being locked away in Edinburgh or London, City Deals pass power to local areas and allow them to take control to achieve great things. The UK Government has already delivered a City Deal for Glasgow and we are working hard on agreements for other cities, including Inverness and Aberdeen. This is another good example of the UK, Scottish and local governments working tgether for the common good. That is the best way to improve local areas and to improve the lives of people in Scotland. We had a very useful and constructive meeting during which we discussed a number of key issues affecting the Highlands, which are priorities in our Council Programme, including welfare, broadband connectivity, Crown Estates, as well as the Scotland Bill. We also discussed the Council’s ambition for a City/Region Deal and I am very encouraged by the support from the Secretary of State, as we work with both the Scottish and UK Government’s to progress this deal. I am delighted that the Secretary of State has confirmed UK Government approval for these projects. They will make a significant contribution to enhancing the centre of Inverness and improving wifi connectivity for businesses, residents and tourists. 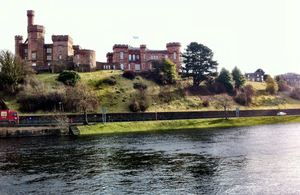 It will also help us to start realising our ambition to make Inverness Castle a major tourist attraction.